In 1967 Anvil Paints & Coatings initially concentrated on manufacturing coatings for tile roofs that were popular in Florida at the time. Today, Anvil produces more than 65 unique and innovative specialty products for the professional painting contractor and the Do-it-Yourselfer. Anvil Roof Coatings today are protecting buildings and homes throughout the America's and the Caribbean Islands. Elastomeric Roof Coatings extend the life of sloped commercial roofs and are also protecting metal roofs in the Manufactured Housing Industry. 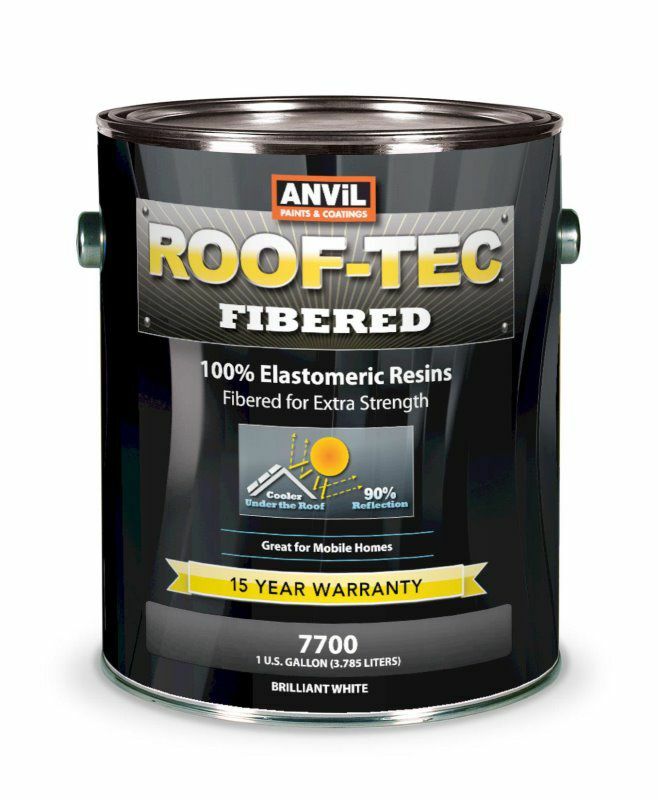 Anvil's newly formulated ROOF-TEC line offers premium elastomeric roof coatings with an unprecedented manufacturer's warranty of up to 20 years. 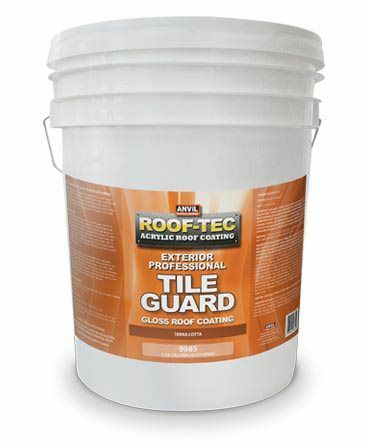 Tile Guard #9980 series is a quality, gloss latex, roof paint. -Provides good hiding, uniform coverage, ease of application, and holds up well in the sunbelt climate. 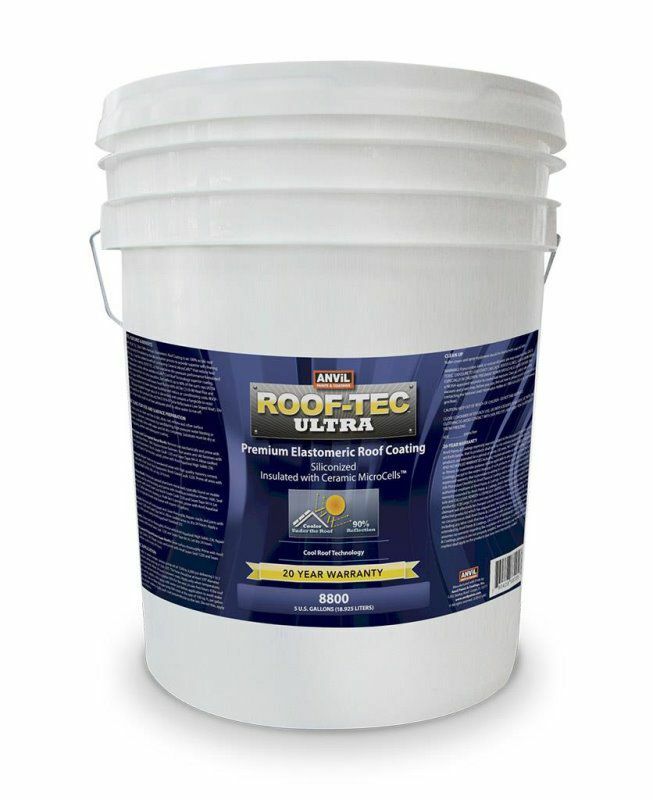 -Formulated for use on unglazed concrete tile, masonry shingle or properly primed metal roofs. -Treated with fungicide to resist mildew growth and discoloration of the paint film. -Gloss finish helps keep roofs looking freshly painted longer. -Acrylic roof coating formulated with interlocking fibers that provide superior bridging of the coating over seams and small separations. -Contains interlocking fibers that increase the coating’s durability to withstand weathering. -Exceeds performance of similar coatings of this type for adhesion and longevity. -Brilliant white finish beautifies and reflects up to 90% of the sun’s rays lowering heat buildup and reducing air conditioning costs. -Stays brighter longer since it contains a fungicide to resist mildew growth on the product film. -Great for mobile home roof protection. Do not use on flat roofs, roofs must have adequate pitch to allow water to run off. #1 Elastomeric Roof Coating is our premium high build 100% acrylic elastomeric roof coating based on the latest chemical technology. 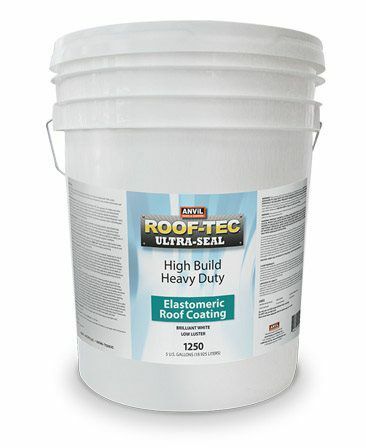 Designed to seal, protect, and insulate well drained roof surfaces. For use on: mobile home roofs, metal roofs, built up roofs, concrete roofs, asphalt shingle roofs, and wood roofs. Do not use on PUF (polyurethane foam roofing), or on flat roofs. Roof must have adequate pitch to allow water to run off. 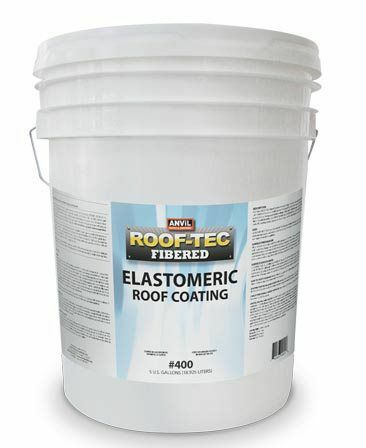 Acrylic latex elastomeric roof coating that is fortified with fibers to provide superior bridging of the coating over seams and small separations. Exceeds the performance of similar coatings of this type for adhesion and longevity. It’s brilliant white finish not only beautifies, but reflects the sun’s rays lowering heat buildup and reducing air -conditioning costs. The coating resists damage by hail and rain, and insulates against noise and the corrosive effects o their attack. 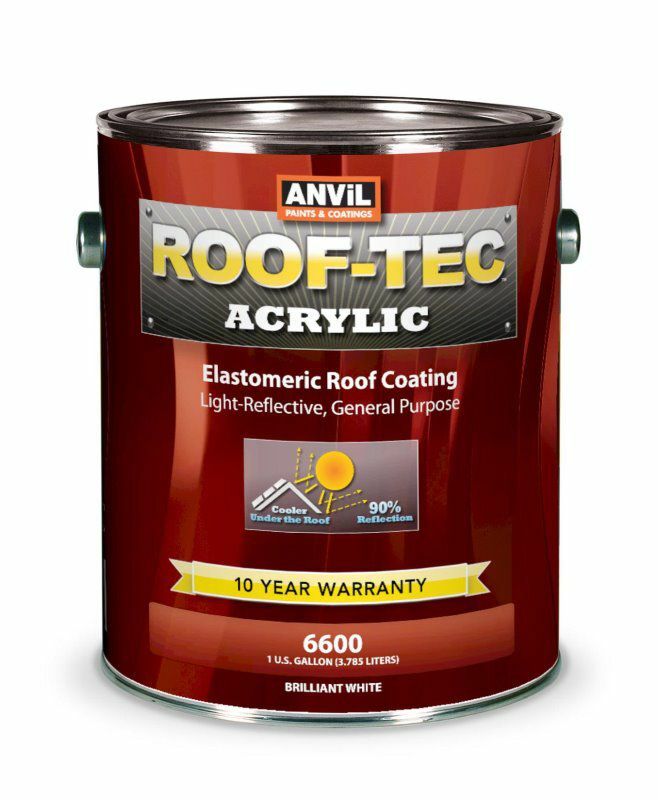 Anvil’s ROOF-TEC Acrylic Elastomeric Roof Coating is an acrylic latex roof coating formulated to provide superior bridging of the coating over seams and small separations. Exceeds performance of similar coatings of this type for adhesion and longevity. Its brilliant white finish not only beautifies, it reflects up to 90% of the sun’s rays lowering heat buildup and reducing air conditioning costs. Stays brighter longer since it contains a fungicide to resist mildew growth on the product film. Do not use on flat roofs. Roofs must have adequate pitch to allow water to run off. 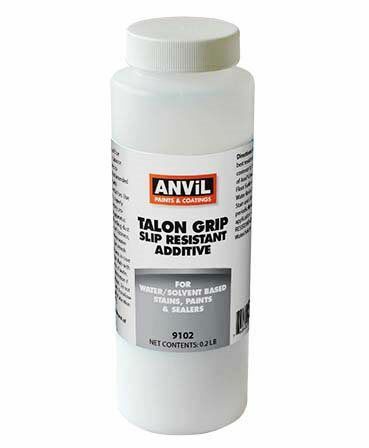 Anvil TalonGrip Slip Resistant Additive is a finely ground polymer material to be added to paint or stains to achieve a slip resistant surface on walkways, driveways, garage floors, patios, pool decks and other surfaces. May also be added to paints to create a fine texture effect. Provides optimum abrasion resistance and is more comfortable to bare feet on pool decks and similar surfaces than sand additives. Low density and reduce or eliminate settling and provide optimum performance in film forming water based or solvent based paints, stains and sealers without changing the viscosity. -Brilliant beautifies and reflects up to 90% of the sun’s rays lowering heat buildup and reducing air conditioning costs.